History of Kashmir is recorded since 3450 BCE through Rajatarangini, written by Kalhana. Kashmir has more than 5400 years of history, lineage of Kashmir Kings and pre-mahabharat era Kashmir valley formation by Kashyapa Rishi by cutting the gap in the hills at Baramulla. Name “Kashmir” means “desiccated land” (Sanskrit: Ka = water and shimeera = desiccate). In Rajatarangini(Riverflow of Kings), a history of Kashmir written by Kalhana around 1150 CE, it is stated that the valley of Kashmir was formerly a lake, which was drained by the great rishi or sage, Kashyapa, son of Marichi, son of Brahma, by cutting the gap in the hills at Baramulla (Varaha-mula). When Kashmir valley had been drained, Kashyapa asked Brahmans to settle there. That is how Kashmir Pundits started inhabiting the valley with human population. The name of Kashyapa is by history and tradition connected with the draining of the lake, and the chief town or collection of dwellings in the valley was called Kashyapa-pura, which has been identified with Kaspapyros of Hecataeus (apud Stephanus of Byzantium) and Kaspatyros of Herodotus. Kashmir is also believed to be the country meant by Ptolemy’s Kaspeiria. 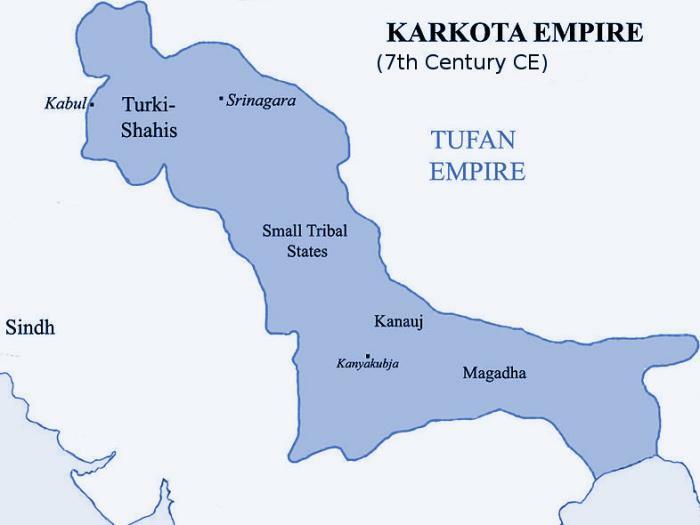 During Mahabharata era, Kambojas ruled Kashmir during the epic period with a Republican system of government from the capital city of Karna-Rajapuram-gatva-Kambojah-nirjitastava, shortened to Rajapura, which is modern Rajauri. Peer Panjal, which is a part of modern Kashmir, is a witness to this fact. Panjal is simply a distorted form of the Sanskritic tribal term Panchala. Muslims prefixed the word peer to it in memory of Siddha Faqir and the name thereafter is said to have changed into Peer Panjal. Jammu was founded by Hindu King Raja Jambu Lochan in the 14th century BCE. During one of his hunting campaigns he reached the Tawi River where he saw a goat and a lion drinking water at the same place. The king was impressed and decided to set up a town after his name, Jamboo. With the passage of time, the name was corrupted and became “Jammu“. Authentic sources of Kashmir history are Nilmata Purana (complied c. 500–600 CE) and Rajatarangini (1150 CE). Kalhana’s Rajatarangini (River of Kings), has all the 8000 Sanskrit verses of which were completed by 1150 CE, and chronicles the history of Kashmir’s dynasties from Mahabharata times to 12th century CE (4600 years of history and complete list of Kashmir Kings). During the reign of Muslim kings in Kashmir, three supplements to Rajatarangini were written by Jonaraja (1411–1463 CE), Srivara, and Prajyabhatta and Suka, which end with Akbar’s conquest of Kashmir in 1586 CE. This list and timings are derived from Rajatarangini. 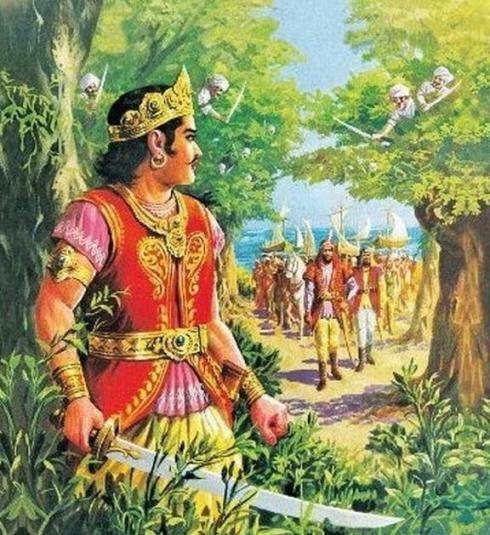 Gonanda I was relative of Magadha ruler Jarasandha and contemporary to Yudhishtir. He was killed by Krishna’s elder brother Balarama. 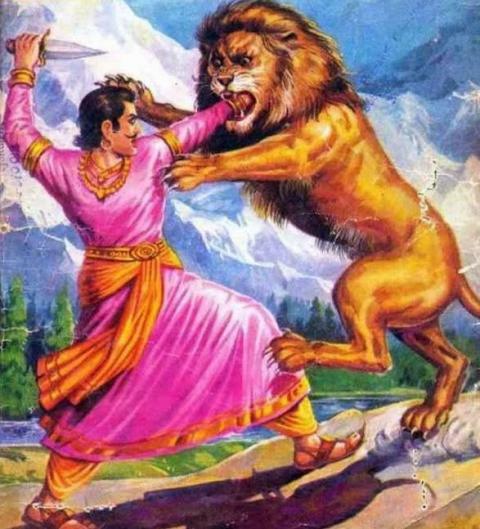 His son Damodara I was killed by Krishna and his army. Later Krishna made his wife Yasovati as temporary ruler for 6 months, who was succeeded by her son Gonanda II. This Gonanda II was Killed in a battle with Parikshit (grandson of Arjuna), king of Hastinapura in 3083 BCE. As Gonanda II has no heir, Parikshit took over the kingdom of Kashmir, incorporated it into his empire and handed it over to Harnadeva, who was from his family. From Harnadeva, Pandava dynasty kings ruled over Kashmir for 1331 years from 3083-1752 BCE. Gonanda I was a poet. Dharmasoka, who belonged to the Gonanda dynasty, freed himself from sins by embracing Buddhism and built the city of Srinagar, with ninety-six lakhs of houses, resplendent with wealth. He too was a poet. This Vasunandana was a poet and author of Samara Sastra. This Gopaditya built the temple of Adi Sankara in 367-366 BCE. He founded several temples and Agraharams. He was also a poet. This 74th king Pratapaditya is mentioned in Rajatarangini as a relative of Vikramaditya, was brought by the ministers from a distant land and placed on the Kashmir throne. He ruled Kashmir from 272 to 240 BCE. Vikramaditya referred to here must be Sri Harsha Vikramaditya of Ujjain from 457 BCE. Kalhana says that this Vikramaditya, the relative of the Pratapaditya was not the Sakari Vikramaditya from 57 BCE. This Hiranya died issueless. He was elder brother of Toramana, who along with his wife and son were in exile. He was sent by Emperor Vikramaditya of Ujjain as King of Kashmir. This Lalitaditya built the famous Martanda (Sun) temple in Kashmir. Total 17 kings ruled for 600 years. These 8 Kings ruled for 84 years. This Lohar family belongs to the Andhra Satavahana dynasty. This Simharaja, father of Didda, is the son-in—law of Bhima Sahi of Kabul who belonged to the Thomara Dynasty, one of the four Agni Vamsi. These ten Brahmin kings ruled for 76 years. Anantadeva was dethroned for few days in 1062 CE, but came back. These six kings of Lohar Dynasty ruled for 98 years. Kalhana’s time is 1148 CE. That means, from 3450 BCE we have the history of Kashmir for 4593 years and then till today, which is 5467 years. Kalhana’s father was a tributary to the king of Kashmir, besides being the Prime Minister. This family might have been a branch of the Satavahana dynasty. Earliest Neolithic sites in the flood plains of Kashmir valley are dated to c. 3000 BCE. Most important of these sites are the settlements at Burzahom, which had two Neolithic and one Megalithic phases. This proves the history of Kashmir for almost 5000 years. 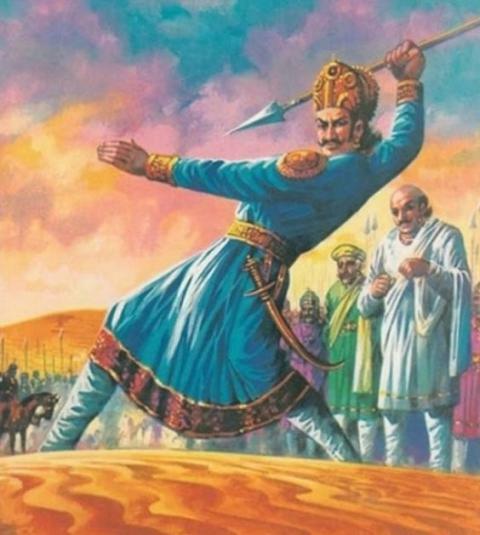 Lohar dynasty (1012–1320 CE) paved the way for foreign invasions of Kashmir. Suhadeva, last king of the Lohara dynasty, fled Kashmir after Zulju (Dulacha), a Turkic–Mongol chief, led a savage raid on Kashmir. Rinchana, a Tibetan Buddhist refugee in Kashmir, established himself as the ruler after Zulju. Rinchana’s conversion to Islam is a subject of Kashmiri folklore. He was persuaded to accept Islam by his minister Shah Mir, probably for political reasons. From the 14th century, Islam gradually became the dominant religion in Kashmir. The Sultans between 1354–1470 CE were tolerant of other religions with the exception of Sultan Sikandar (1389–1413 CE). Sultan Sikandar imposed taxes on non–Muslims, forced conversions to Islam, and earned the title But–Shikan for destroying idols. Later, Mughals (1580s–1750s), Afghan rulers (1750s–1819), Sikhs (1820–1846 CE) ruled over Kashmir. Between 1846-1947 CE, there was Princely State of Kashmir and Jammu (Dogra Rule).